Dried apricots & chickpeas coated in a harissa sauce, served on couscous with Swiss chard. Couscous: Place in a large bowl with a pinch of salt, pour in boiling water (1 cup for 4; ½ cup for 2) and add the vegetable stock fonds. Cover with cling wrap and leave to stand and swell for 10 minutes. Remove the cling wrap and fluff up with a fork. Apricot harissa chickpeas: Place a pan on medium-high heat and add a drizzle of olive oil. Add the onion with a pinch of salt and sauté for 5 minutes before adding the apricots, harissa, chickpeas and water (½ cup for 4; ¼ cup for 2). Cook for 2-3 minutes, then add the coriander and mix through. Swiss chard: Place a different pan on medium-high heat, add the Swiss chard with a drizzle of olive oil and a splash of water and wilt for 1-2 minutes. Season with salt and pepper. 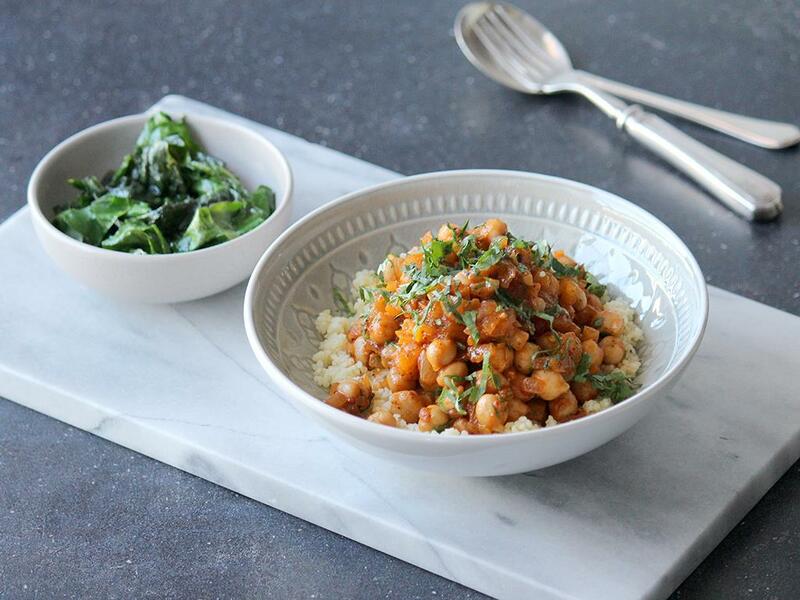 Serve the apricot harissa chickpeas on the couscous with the Swiss chard on the side.